Tesco shoppers will be able to earn loyalty points by not using new plastic bags in a move designed to cut waste. The 13 million holders of Tesco clubcards will earn points for every old plastic bag they use and for using their own bags to carry their shopping. The retailer hands out 4 billion plastic bags every year and hopes to reduce this figure by 25% by 2008. Retailers are under pressure to reduce consumption of plastic bags to protect the environment and save energy. Every year, about 17 billion bags are picked up by consumers from the UK's stores, only to be thrown away. Under the new scheme, Tesco customers will also be able to gain points - which they can redeem to buy goods - by using cardboard boxes provided in stores. The number of points earned will be at the discretion of check-out staff, depending on the size of bags used. Tesco recycles 150,000 tonnes of plastic bags and cardboard boxes every year, but admits it needs to do more to help change customer behaviour. "There are problems and challenges we face looking after the environment that we have all got to address," Tesco chief executive Sir Terry Leahy said about the initiative. "We have to encourage customers to play a part." 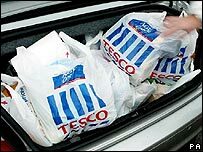 Sir Terry said Tesco would also look at its use of plastic bags in its home delivery service, but would not be charging for bags. More and more retailers are exploring ways of limiting use of non-degradable bags. For many years Sainsbury's gave a penny back to customers who reused old plastic bags, although this scheme ended last year. Asda is urging its customers to buy new reusable bags, which will cost shoppers up to 5p each. The money raised will go to charity. For several months, Ikea has been charging customers 5p for each plastic bag bought, while B&Q has tried out a similar scheme. The Irish Republic has charged shoppers 10p for bags since 2002, a move which has significantly cut their usage.